Conversion is a feasible solution to continued Mobil operation where C.A.R.B. rules must be followed. 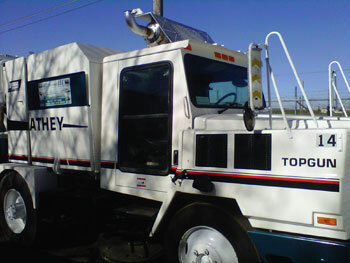 The Athey Mobil Street Sweeper is still considered by many as the flagship of their street sweeping fleet. They are a well built, highly functionable sweeper that can tackle many of the jobs newer sweepers still have trouble with. Unfortunately, Athey, the manufacturer of Mobil, went out of business many years ago. This has left little to no support in retrofitting or modifying this equipment. When the California Air Resources Board (C.A.R.B.) enacted its regulations for On-Road Diesel trucks, the Mobil immediately came into question. It was in fact presented to C.A.R.B. to exempt these particular sweepers from the regulation because of the lack of manufacturer support and the lack of a safe and efficient area to mount the PM filter. 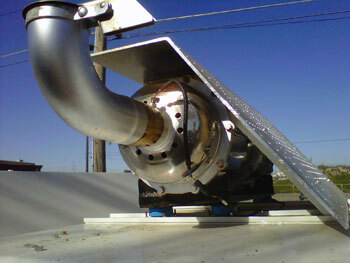 All of the PM (Particulate Matter) filters on the market are large and generate a tremendous amount of heat. The Mobil has a conventional cab and no spaces or caverns in the body to safely install a filter, this posed to be an extremely serious matter. After much deliberation C.A.R.B. decided not make any exemptions for the Mobil. This caused serious concern amongst sweeper fleet owners being that many smaller fleets in California are comprised solely of Athey Mobil Sweepers. If these fleet owners did not have a viable and economically feasible way to bring their equipment into compliance they would be forced to purchase a new or used sweeper at a substantially higher cost. Because we had recently become a dealer of Econix Diesel Particulate Filters, we saw both a solution and a challenge in finding a safe and a financially feasible resolution to an extremely complex situation. We approached this problem from a safety and feasibility standpoint, with safety being our primary concern. We spent quite a bit of time planning and experimenting with locating the components of the system in various places and positions. After some time and research we discovered that the best mounting area would be on top of the cab. Our technicians designed a rail mounting system and heat shield/deflector to assist with heat dissipation and protecting the DPF components from any damage. The rail mounting system provides plenty of support for the components as well as a rigid substructure to mount the heat shield/deflector. The mounting system provides for proper and safe installation, while also keeping the height of the components below the highest point of the truck. In addition, it properly routes the exhaust away from the operator. The Econix Diesel Particulate Filter system we installed is a top of the line DPF with the lowest regeneration time in the industry. This allows for quick 10 minute regenerations rather than losing a large amount of time regenerating or having to plug the system into an electrical source to complete the regeneration. To date, Wells Sweeping is the first and only company to properly and safely install a DPF system on an Athey Mobil Street Sweeper. We are very proud of this accomplishment and very excited to share this solution with our fellow sweeper fleet owners.